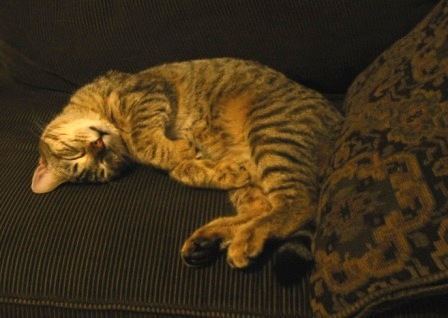 A recent, reluctant addition to my life has been ‘the cat’. I was quite indifferent about the cat and really felt that if the cat left my life or never came into it in the first place I would be pleased. Well, the cat has been here for about 3 months and damn it if The Cat now has wiggled its way into my cold heart. I find that I enjoy seeing The Cat meet me at the door, its dark face looking up at me with a crazy look, like “where the hell have you been?” I have grown accustomed to The Cat’s passive/aggressive yet effective way of waking me up by walking on my bladder at 4:30 in the morning, back and forth, back and forth. I am secretly proud that only I have found a way to effectively, with out sharp malice from The Cat hold and pet The Cat. I have gladly given up my seat at the table literally. 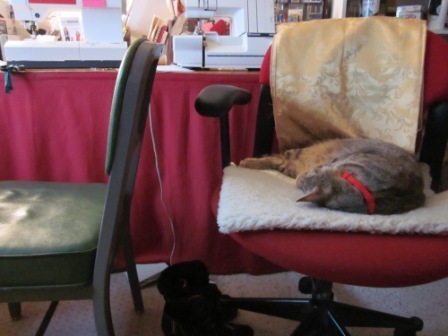 At my desk I am now sitting on the lumpy green chair while The Cat sits on the coveted red cushy chair complete with lambskin lovely humbly supplied by myself(but if anyone asks it’s there because of the cat hair). But,what I really love, I mean like, is on Sunday afternoons when it’s chilly and wet outside and I have the luxury of taking a nap there is The Cat curled up beside me with a loud gravely purr. Sweet. Dogs rock too. I wish I were a dog sometime, with a good owner only. I wish I had a cat. Maybe someday. Maybe soon, we never know what the future holds for us. I am good with that.